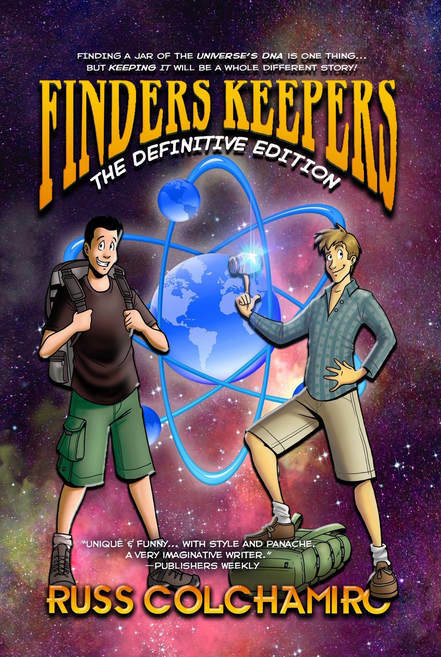 Author Russ Colchamiro has gone back to the future to deliver his wildest, funniest novel yet--the updated Sci-Fi/Fantasy tale Finders Keepers: The Definitive Edition. SciFi Comedy is a sub genre that has been around for awhile, but not as easy to find. The most notable was the 5-part Hitchhikers Guide to the Galaxy trilogy (yes 5 books in a trilogy). 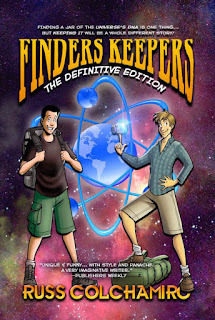 Finders Keepers is another fun read in this genre. It was first released in 2010 and was the author's debut novel. Recently, with more experience under his belt and several other books published, author Russ Colchamiro decided to revisit this first title, looking at it with more experience eyes, and offer an updated edition - The Definitive Edition. Finder's Keepers follows the story of a jar containing material vital to the creation of new universes. It has been lost on earth - a huge error that could bring down ruin on the 2 professionals who lost it. The story line offer the zany unexpected twists and turns and crazy interpersonal that we look for in this genre. It opens in an otherworldly dimension where immortals create new worlds. They have remarkably human characteristics - they live, party, play, suffer politics, have self doubts, compete to be the best, worry about their future and love. We then move to Earth where we follow several characters - both human who have no idea what is happening and several who were cast out of the heavens. They want to find the jar to use it as a key to get back home. While I enjoyed the humor and fun of this story, I found there were a lot of characters, places and situations to keep track of. The story line changed locations the characters were following often, usually with each new chapter, so keeping track of the storyline and who's who is a bit of a challenge. A fun read, but a little confusing at times. 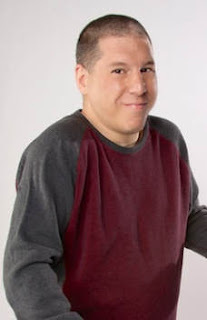 Russ Colchamiro is the author of the rollicking space opera, Crossline, the zany SF/F backpacking comedy series Finders Keepers, Genius de Milo, and Astropalooza, and is editor of the SF anthology Love, Murder & Mayhem, all with Crazy 8 Press.